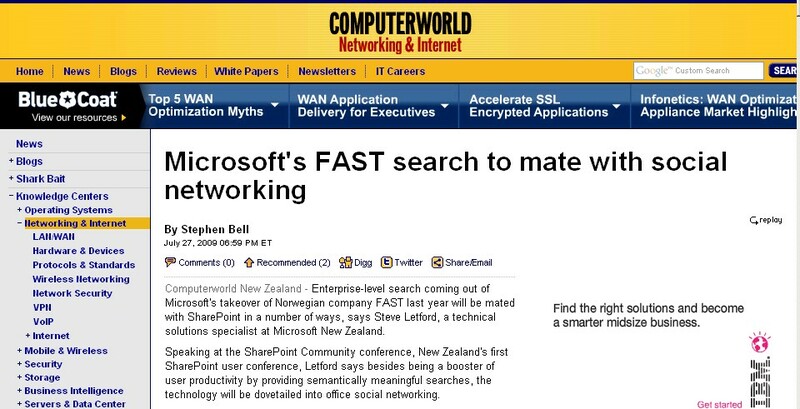 Short prompt – Steve Letford, technical solution specialist in Microsoft New Zealand mentioned that FAST Search Technologies will be mated with SharePoint for social networking. Looking on coming SharePoint 2010 it sounds like interesting statement. FAST, acquired by Microsoft in the beginning of the last year was targeted to reinforce Enterprise Search domain (also part of SharePoint). It will be interesting to see what will be meaning of social networking in context of SharePoint. In my view, it will make SharePoint even stronger, comapred to what exists today. In parallel, it will need to compete or co-exist with some PLM initiatives such as Social Product Development and Social Innovation announced earlier this year by PTC and DS.